Excessive bureaucracy or adherence to rules and formalities, esp. in public business; excessive regulation or rigid conformity to formal rules that is considered redundant or bureaucratic and hinders or prevents action or decision-making. Our business philosophy and our our core values have always been simple and to the point. We do what we say we are going to do, when we say we will do it, and for the price we agreed to. In other words, never make it difficult for our clients to do business with us … No Red Tape! Well, while discussing options for our new name and how it might reflect this idea, someone asked the question, "What is the opposite of Red Tape?" It was out of this discussion that our name and brand were born. Blue Tape. In today's business environment, most organizations have enough challenges to deal with. Hurry up! Do more! But, do it with less! So, the last thing most organizations need more of is… challenges. Especially those associated with getting the help needed to make them more effective and efficient. Our commitment is this. Always be part of the solution ... Never be part of the problem. 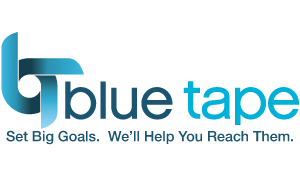 Blue Tape: dedicated to being part of the solution, not part of the problem.